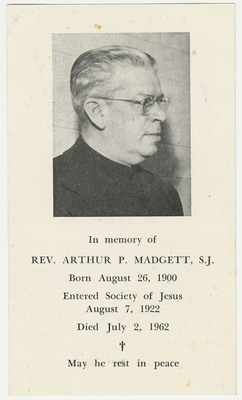 "Arthur Madgett memorial holy card"
Funeral prayer card for Arthur Madgett, 1900-1962. The front of the card contains a photograph of Father Madgett and biographical information. The back of the card a prayer and the suscipe. This card was made by an unknown publisher. Madgett was professor of theology at Xavier University, (Cincinnati, Ohio). (front) In memory of Rev. Arthur P. Madgett, S.J. Born August 26, 1900 Entered Society of Jesus August 7, 1922 Died July 2, 1962 May he rest in peace (back) Prayer. Grant, we beseech Thee, O Lord, that the soul of Thy servant, Arthur, whom Thou hast honored in this life with the sacred functions of the Priesthood, may forever rejoice in the bliss of heaven. Through our Lord Jesus Christ, Thy Son, Who liveth and reigneth world without end. Amen. Eternal rest grant unto him, O Lord. And let perpetual light shine upon him. may he rest in peace. Amen. Suscipe. Take, O Lord, and receive all my liberty, my memory, my understanding, and all my will. Whatsoever I have and possess, Thou hast given all to me. To Thee, O Lord, I restore it. All is Thine. Dispose of it wholly according to Thy will. Give me Thy love and Thy grace, for this is enough for me. St Ignatius of Loyola. "Arthur Madgett memorial holy card" (1962). Jesuit Memorial Holy Cards. 34. 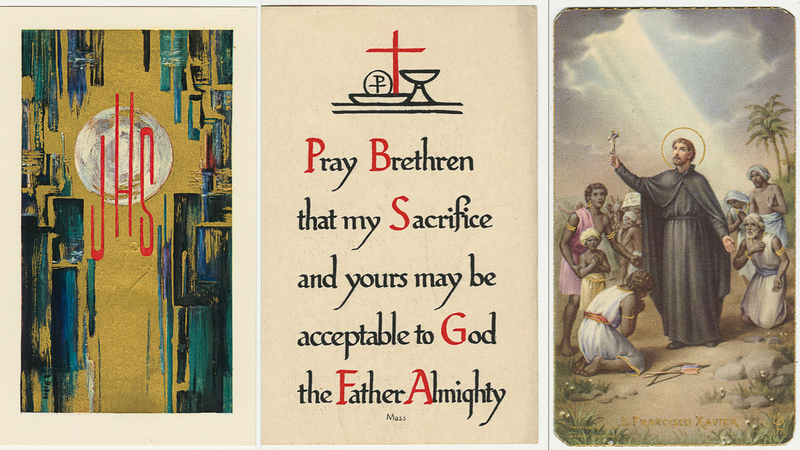 The Jesuit Memorial Card Collection is the physical property of Xavier University. U.S. and international copyright laws protect this digital resource. The majority of the cards in this collection were published after 1923 and therefore may not be in the public domain. Images, text, or other content downloaded from the collection may be freely used for non-profit educational and research purposes, or any other use falling within the purview of "Fair Use". However, in order to use the digital reproductions for any other reason users must have the express consent of the copyright holder. Contact Xavier University Archives to inquire about permissions to use the digital image.